Journal52: Prompt 01 – Up, Up, and Away! I’ve joined a free year-long journal prompt group, Journal52, run by Chelle Stein. Even as I joined it, I cringed a bit because I knew I wouldn’t be able to keep up. It’s already been a busy year, and it doesn’t look like it is going to ease up anytime soon. But that’s a problem we all have, isn’t it? So I decided on some ground rules. Rule 1: No fretting. Even if I can’t keep up with the weekly prompts and even if I break my own rules. Rule 2: K.I.S.S. –Keep It Simple, Stupid. Not necessarily a simple result, but simple techniques that are quick and easy to do. Rule 3: No planning. This is going to be a slapdash, take 5 minutes to glue down some collage or doodle some lines. Rule 4: No inner critic allowed. What I get is what I get. I’m not competing with myself or anyone else. This journal is to be an exploration and fun. Period. Rule 5: Remember Rule 2 and quit making rules! Prompt 01 was ‘Up, Up and Away!’ My page was done over a two-week period, 5-10 minutes at a time. I used Cyan, Magenta and Yellow acrylic paint for a background. Bits of sheet music were glued down pretty much at random. 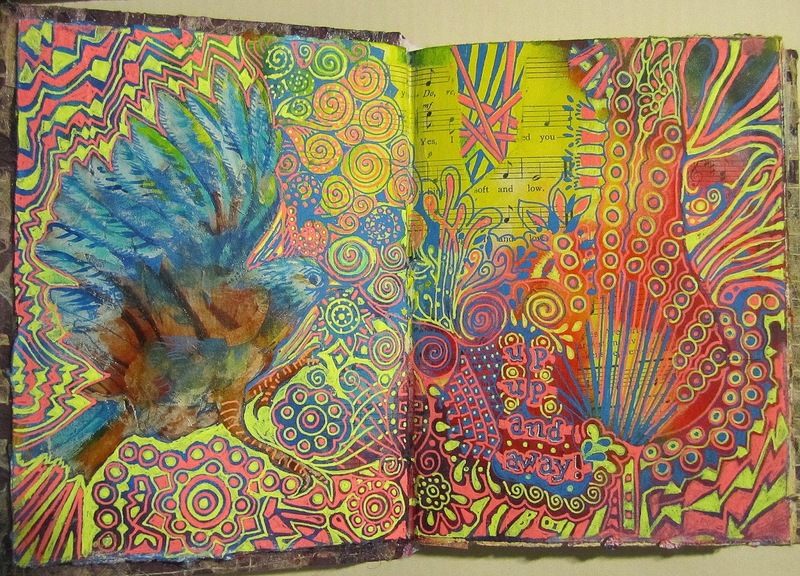 The bird was done collaging decopatch papers and then drawing over it with gellyroll pens. The tangles were all done with gellyroll pens. Next Post: Journal52: Prompt 01 – Up, Up, and Away! Wow, this is gorgeous! And I really love the randomness of the design and the color just seems to pull it all together. Your brain prefers to operate at it's best with no rules! Those are great rules. It's amazing that it was done over a period of 2 weeks. I will have to learn that from you to be patience and keep going. I am really bad that if I can't get something completed in a day or two, I would declare failure and don't go back to it. Really like the colors … it looks antiqued. Vibrant but soothing. I love this, but I really, really have a hard time getting anything to write well over acrylics or watercolors in my journal pages. Thank you! I struggle with patience as well, but I try to make it a challenge and know that it is a trait that will help me in all aspects of my life. At least, that's what I try to tell myself, lol! Writing over acrylics and watercolor can be challenging. Surprisingly, cheaper acrylics & watercolor can be easier to write over than the expensive professional brands–all that lovely pigment can be part of the problem. I usually find the gellyrolls will work even over the expensive ones, but I let the paint sit for at least 24 hours so it is well and truly cured completely. With the acrylics, I often put down a coat of transparent gesso so I can use other mediums with no problem. You can use the gesso over watercolor, but run the risk of making it smear. Have a great and most creative week!! !